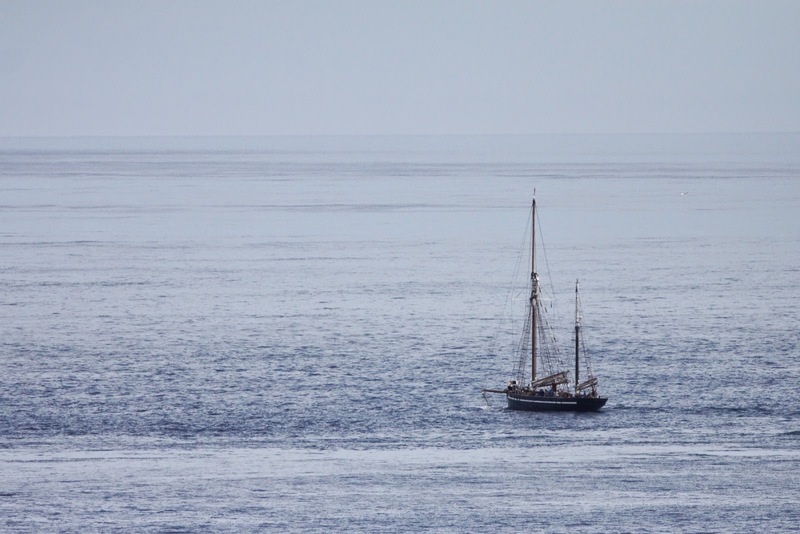 Fair Isle Bird Observatory: the Warden's diary: All at seabirds. It’s been a busy summer, with seabirds taking up a lot of our time – a welcome change from many recent years. It’s also been busy at the Obs, with a virtually ‘full house’ for much of the last month, so there’s not been a lot of time for keeping the blog up to date – sorry about that! 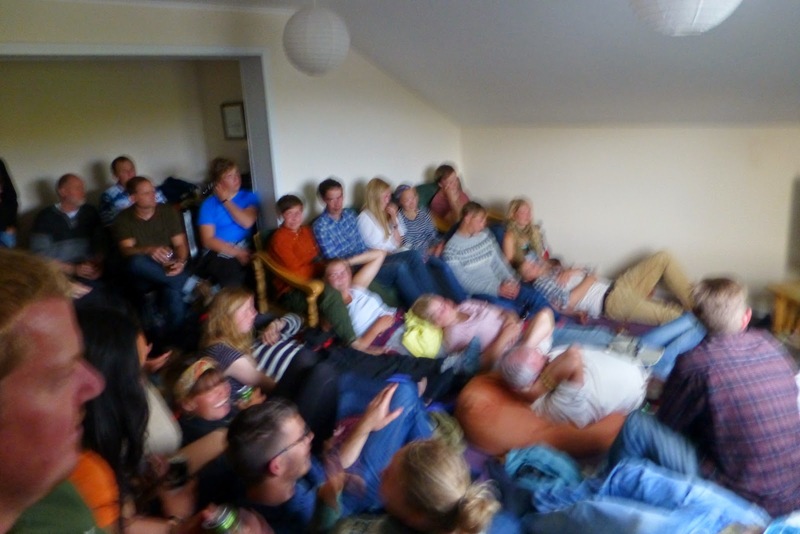 The Swedish training ship the Atlantica called into Fair Isle for a night and its crew were responsible for a sizeable percentage of the 37 people watching the World Cup final in the Warden's flat! A generally busy time of year also saw the first Sheep Hill of 2014. 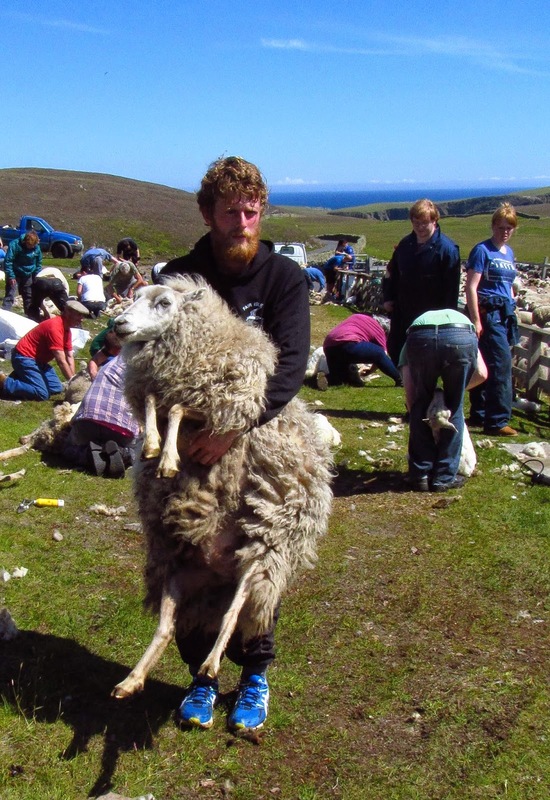 Here Ciaran takes a yowe off to be clipped (Ciaran is the slightly taller of the two). Photo by Carol Jefferies. Amongst the birds, the obvious highlight has been the Swinhoe’s Petrel, which is still present in the Havens (although it is only recorded when we have Storm Petrel ringing sessions taking place, obviously). There’s been Leach’s Petrel also regularly recorded at the trapping sessions, usually arriving simultaneously with the Swinhoe’s and the two are often heard calling together; a nice comparison. In order to try to make the most of the Storm Petrel ringing (we currently stop for the night if the Swinhoe’s Petrel is caught to ensure it isn’t caught more than once a night), we’ll be trying out other sites around the island to see where else we can catch Storm Petrels without the Swinhoe’s coming in. 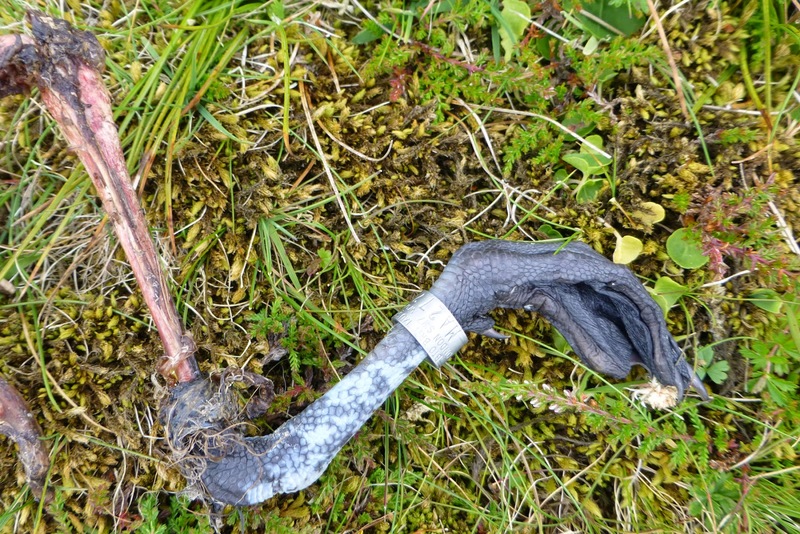 That means for the next week at least we’re very unlikely to be ringing in the Havens (we’ll put a further update out on Storm Petrel ringing on 28th July). 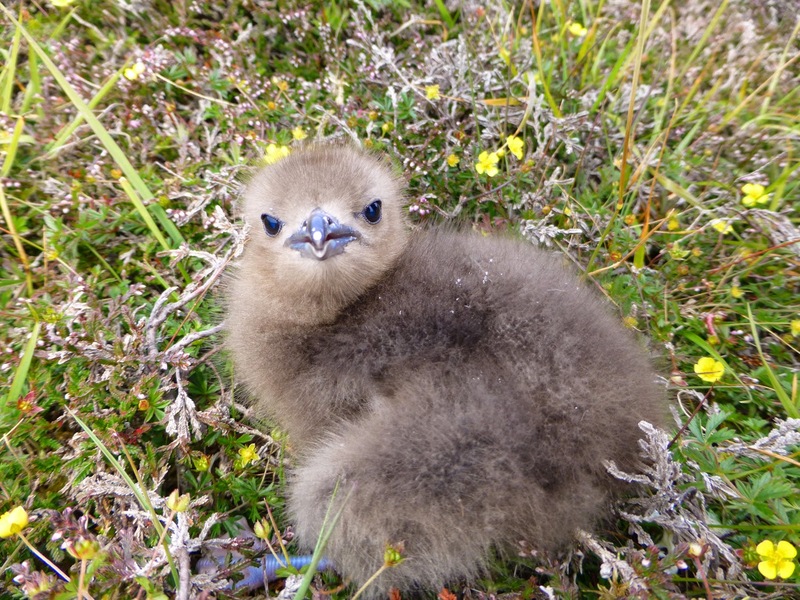 There's a long way to go for the Arctic Skuas, but some have large chicks now, whilst in other nests, the chicks are just hatching. However it's been mixed news for the Bonxies, where record numbers nesting are not going to produce a massive amount of chicks judging by the evidence so far. Cannibalism in the colony has been noted, usually a sure sign that there isn't enough food to go round. Of the two ringed chicks I have found eaten, both were near their nests, suggesting that the parents were away for extended periods foraging when the youngsters were attacked (or that older chicks are killing their younger siblings in times of food shortage). The other good bird that has been lingering is the Marsh Warbler in the Obs garden, whilst the oversummering Chiffchaffs (at least a couple of them) and Robin have been joined by the occasional unusually-timed migrant, with Blackcaps on 30th June-1st July and 7th July, Willow Warbler (1st July), Lesser Whitethroat (2nd July), Song Thrush, sporadic Mealy Redpoll sightings (of up to two birds) and a Whitethroat (which is ringed and very likely one that has summered quietly somewhere unseen on the island - an apparently injured bird seen in mid-June suggests it could have been lurking in the heather keeping out of sight). Also summering was the male White Wagtail, which was still present at Easter Lother Water. A few Collared Doves were expected birds of mid-summer, as were the autumn’s first three Grey Herons (heading south on 11th) and a Quail flushed from Mire of Vatnagaard on 3rd July continued the good spring for the species. Less usual were the House Martin (11th), Sand Martin (17th) and especially the Great Spotted Woodpecker which flew south over the Obs on 12th and was seen near the base of Malcolm’s Head on 15th – the first July record for Fair Isle! Also not expected at this time of year (although not as rare as the woodpecker) was an Iceland Gull on Meoness on 11th and again on 16th-17th. 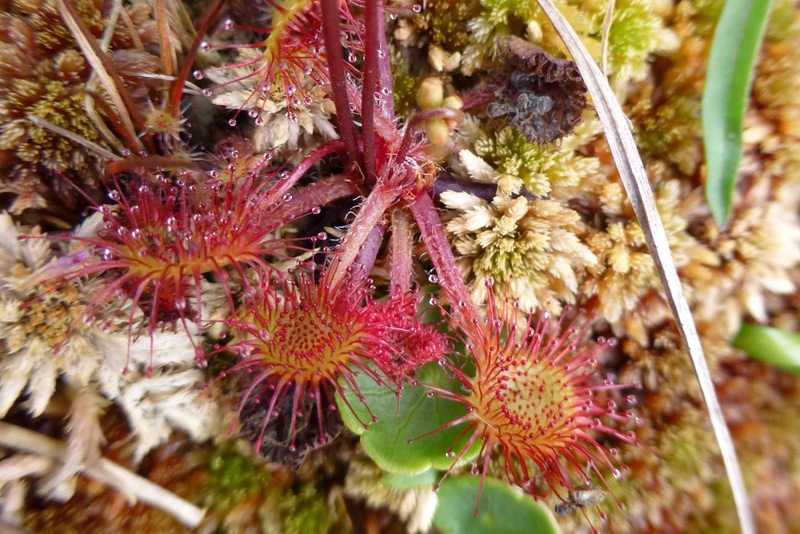 A good selection of plants and flowers can be enjoyed at this time of year, including Sundews (although this one was close to a particularly aggressive Bonxie, so was only enjoyed briefly. Another addition to the year list came in the form of Ruff on 12th July, the highlight from the typical build up of waders that occurs at this time of year, whilst offshore there were Manx Shearwaters daily from 2nd-5th (14 birds recorded in total) and four more during 15th-18th, a reasonable showing for Fair Isle, where seawatching is not really a major feature of the birding year. Staring out to sea can have its advantages though, with a distant group of five Killer Whales (including a couple of mighty bulls) off North Light on 14th, although the two on 1st July were much closer as they came right into South Haven and then Mavers Geo. Unusually, this couple were seen at half past midnight and were first seen by people by on the nets at a Storm Petrel ringing session (on a night that was light enough to be able to read petrel rings by the net at 1am, despite there being no moon!). 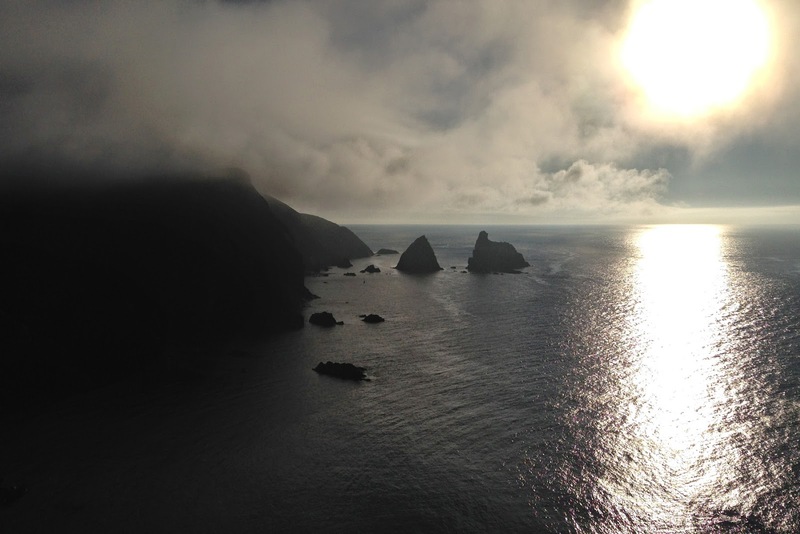 The atmospheric setting looking west from North Light, as photographed here by Ciaran Hatsell (and featured in the opening credits of the BBC series Shetland). That last photograph is stunning!